Walk into any design studio, shoemaker, antique shop, or other working center of creativity in the Oltrarno, and most all of the resident mellow, humble artists will say that they rarely venture over to ‘the other side of the river.’ They avoid it for the duration of high season, leaving it instead to the masses of tourists that descend on the locus of art and history. They flood the most central streets, eager to soak in the city’s ancient culture, to check a renaissance statue or museum off their list, and to cram into the trattorias that they read about in their guidebooks. Yet I can’t help but wonder, (wonder- not wish for- there is a clear difference), why more have not flooded the streets of the Oltrarno, as they are just as beauteous and have far more interesting shops and wine bars, endless fabulous restaurants, and an ambiance immediately more local and authentic. I feel as protective over the neighborhood as the expats and the locals; I want to save it from the crowds. I want to move it farther away from the famed gelaterias at the end of each bridge. Certainly the average visitor is unfamiliar with Convivium Firenze,the foremost catering company founded in1980. The Convivium team has a stellar reputation in Firenze for their exceptional catering. They bring their talents in décor, service, flavors, and aromas to events of all sort- fashion and gala affairs, political receptions, and convention dinners. 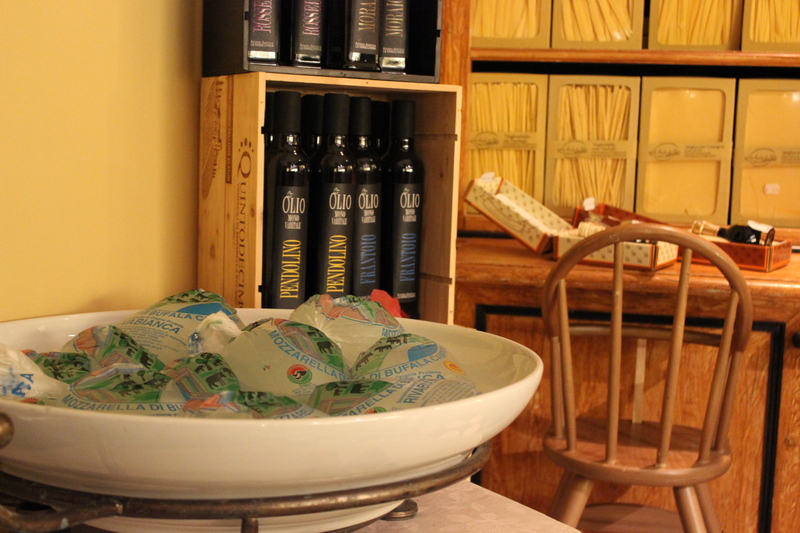 Olio & Convivium, the intimate restaurant and shop in the city center, was an idea that came to fruition after many successful years in the Florentine catering business. The same level of perfection, creativity, and quality can be experienced within walking distance of art galleries, workshops, milliners, and of course, each of the traditional Florence attractions. 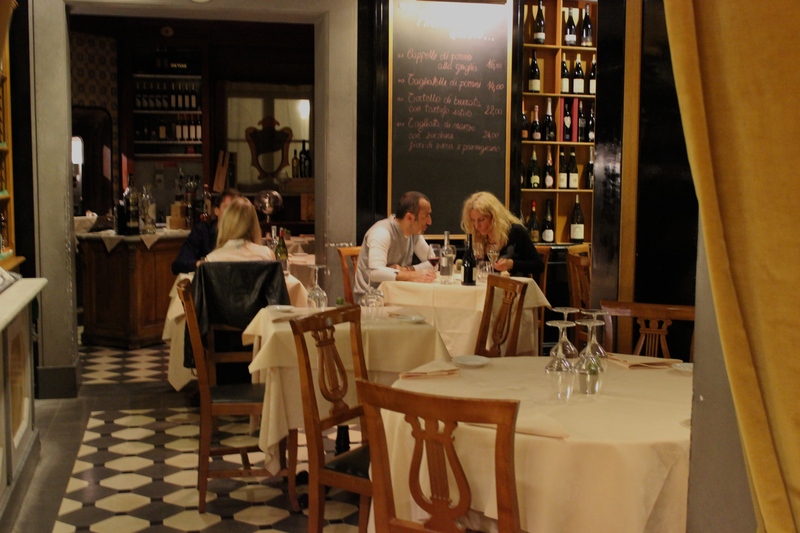 Wander into Palazzo Capponi on my favorite street, Via Santo Spirito, and you will experience a quiet elegance quite difficult to muster in today’s age of trendy and quirky restaurants, or at the other extreme, cold, charmless, and without character. Olio & Convivium is none of the above. 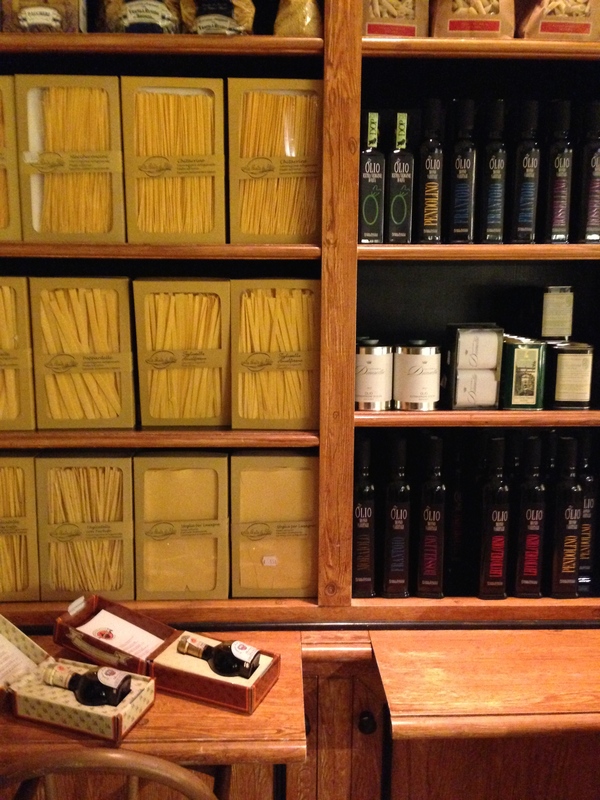 In the cozy shop, you can pick up everyday necessities, such as thinly sliced cured meats, mozzarella, and pasta. 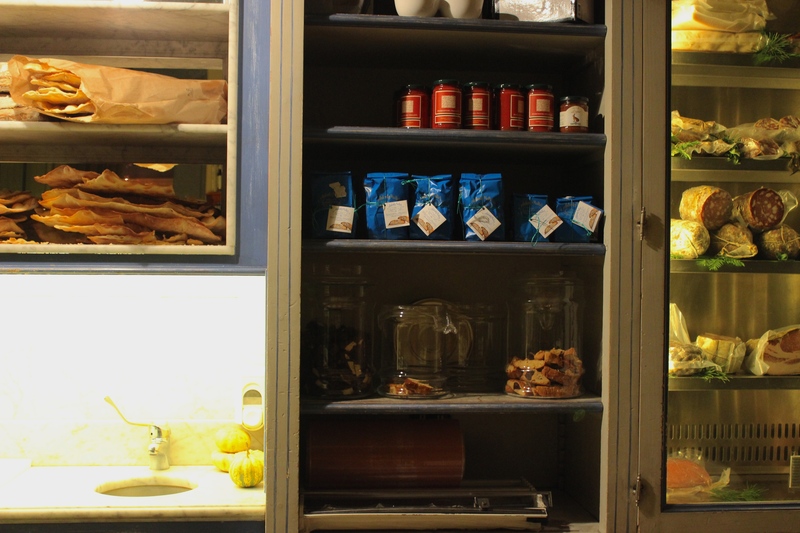 It goes without saying that all of the prodotti are of superior quality: jars of dried tomatoes and sardines, bowls of olives, tins of tea, and bottles of honey neatly line the shelves. Shoppers can assemble gift boxes, or perhaps take an item or two home after a leisurely lunch. Busy Florentines can have their items delivered to their homes or offices. Walk past a case of antipasti, walls of olive oil and balsamico, jars of homemade biscotti, and a bassinet of bagged mozzarella sitting in cold water, and you might spot a few tables around a corner. 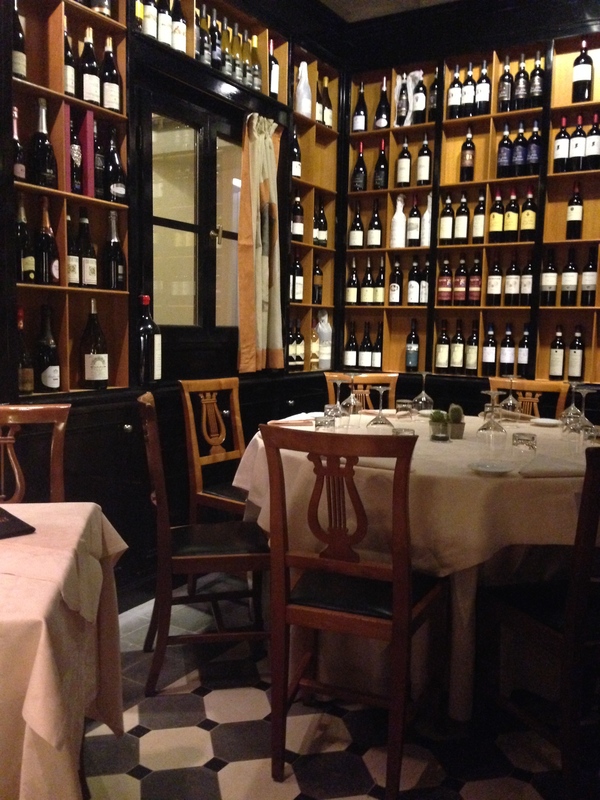 The dining room, beyond the dried pastas and condiments, is one of the most beautiful and elegant rooms I have discovered in my never-ending restaurant explorations. 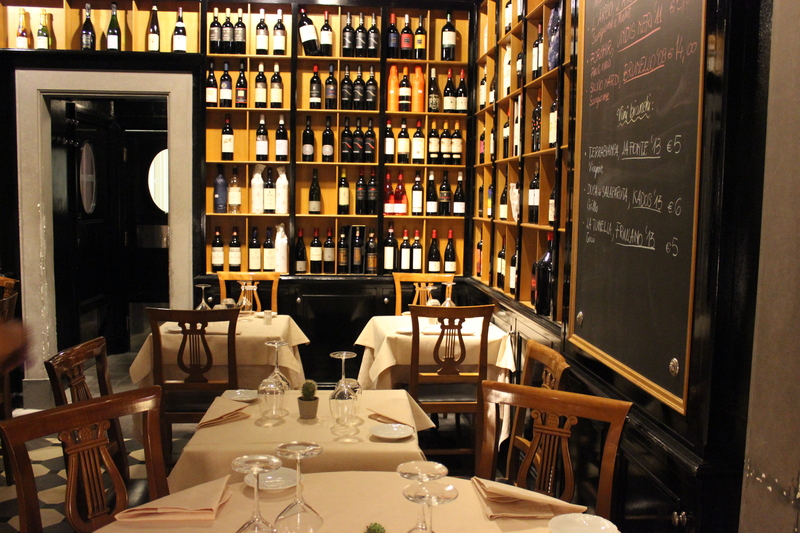 It is cozy, intimate, and warm, with tall ceilings and walls of over 250 pristinely displayed wine bottles. Two blackboards, one on either side, display the day’s specials- both food and wine. Both Convivium prodotti and other Florentine specialties are sold here. As if the dining area is not serene enough, the service makes the experience all the more intimate. Angelo is the most gracious, patient host. He champions the service at Olio & Convivium with such natural flair that we immediately feel as though we are guests in his home. We tell him what we are in the mood for, and he makes thoughtful suggestions layered with friendly conversation, gentle humor, and quiet wit. He is swift, and his two other young servers are equally well-trained. Their synergy needs no speech; they work seamlessly together to make each patron’s experience first class minus the stuffiness. Angelo is equally generous with the restaurant’s offerings. When we request shards of parmigiano, a munificent plate arrives, the rustic pieces served on the same size plate as our secondi, a suggestion of the cheese’s centrality and essentialness at every Italian dining experience. We order a green salad, fully expecting a basic bowl of greens, but to our great surprise, a beautiful plate of fresh leaves is presented. 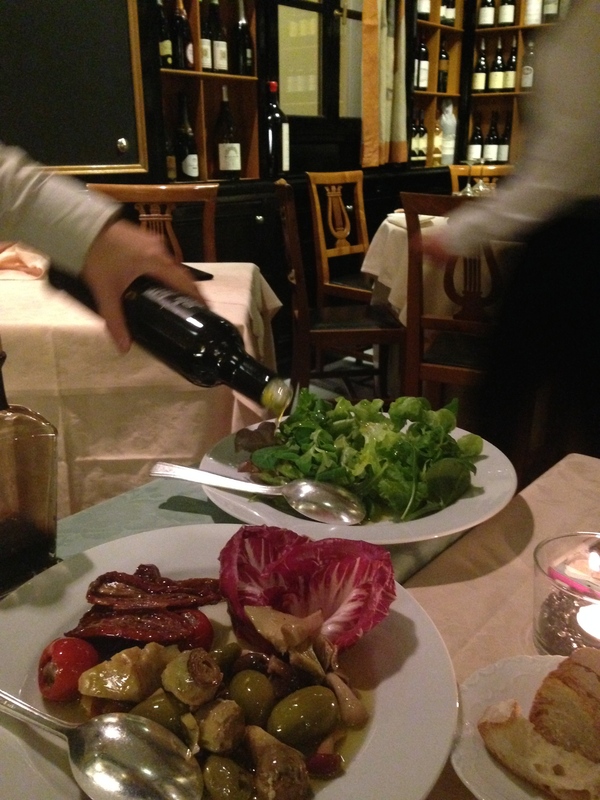 Angelo sets up a side table for our antipasti: the salad sits next to a quintessentially Tuscan offering of verdure sott’olio: mixed olives, small hot peppers stuffed with capers, tender artichokes (carciofi), raddichio, the most beautiful baby mushrooms, and tangy sun-dried tomatoes. The specials of the day are on the blackboard, and in addition to these ever-changing options, the written menu changes every few days as well. On our first night, (we returned a second time in the same week), I order the sea bass with a cauliflower purée and an air of peach tea. Angelo assures me there is no cream and no butter: the puree is purely olive oil and cauliflower, certamente. 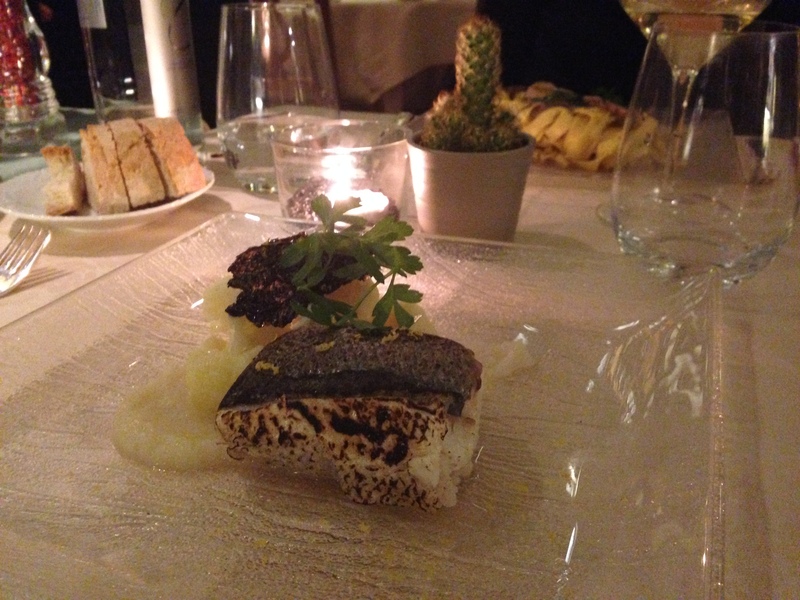 The sea bass flakes at the delicate pressure of my fork, the cauliflower puree is none too thick nor too thin; and it is topped with one or two whole florets. 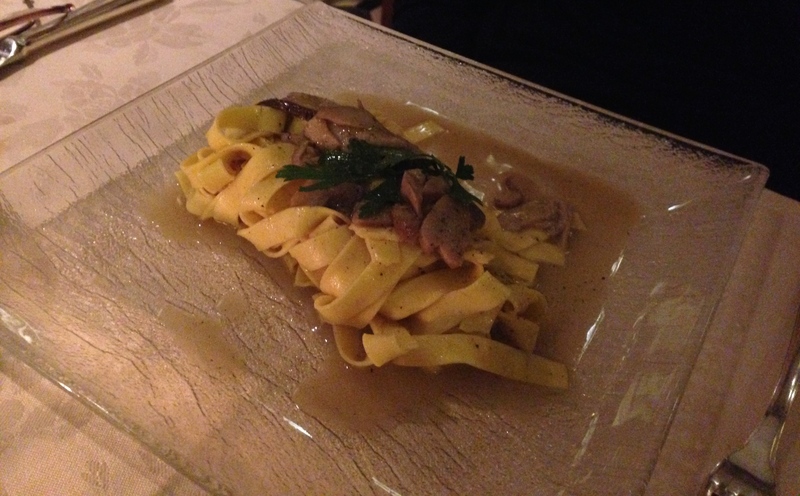 The homemade tagliatelle with porcini mushrooms is exquisitely presented; the mushrooms are tender, the tagliatelle lightly dusted with black pepper and gently coated in fantastic Tuscan olive oil. One parsley stem sits atop the ribbons of al dente pasta. On our second night, we try what quickly becomes the best duck we have ever had, cooked at a low temperature and accompanied by a shallot stew. It is another beautiful plate, creatively enhanced with subtle flavors that lead us to believe the chef may have studied outside of Italy. In fact, Angelo tells us that the main chef is away on his honeymoon, and the sous chef helms from Asia. The blackboard tells us the tagliatelle special is meat sauce senza pomodori; instead of a tomato base, the meat is cooked in wine. Intrigued, I allow Angelo to seduce us once again with the warm, al dente pasta. The dish is simple yet highly original, certainly a great many steps outside of the more predictable Tuscan menu items seen at many of the region’s restaurants, which have remain unchanged for decades. Alla tavola: insalta fresca e verdure sott’olio. Handmade tagliatelle with porcini: molto semplice with one sprig of parsley and perfectly tender porcini. 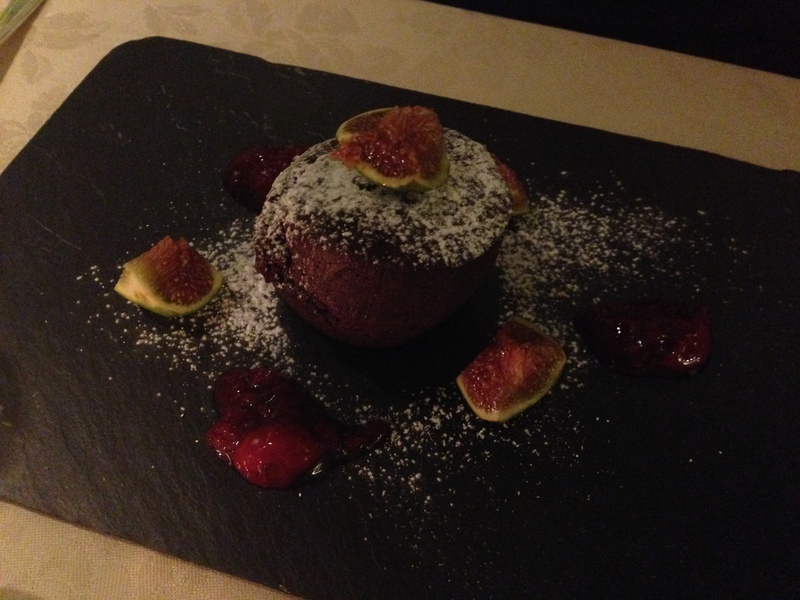 Per dolce: succulent figs, warm strawberries, and dark chocolate cake. Bags of mozzarella in their bath. 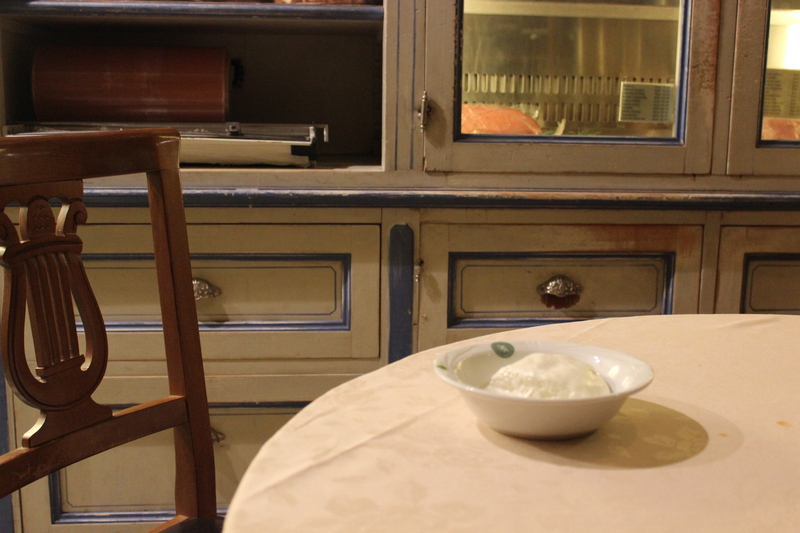 The first night we wandered in, this bowl of mozzarella was sitting at an otherwise empty table as if a renaissance painter were painting its portrait. Peek around the corner and you will find the tranquil dining room. Mista del produtti: jars of the best homemade biscotti I have ever had, coffee, cured meats, and flatbread.